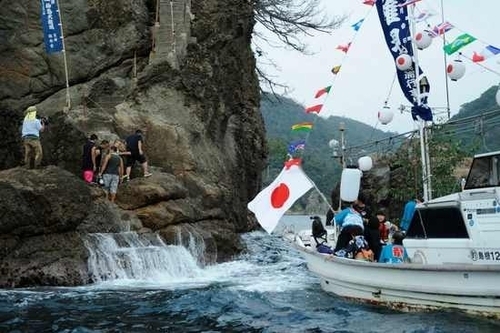 An in-depth analysis on Sagi-ura has already been compiled by the former chief of the Sagi Community Centre in the first edition of the periodical ‘The Forty-Two Bay Pilgrimage’ in the article entitled ‘Regarding Sagi-Ura’. 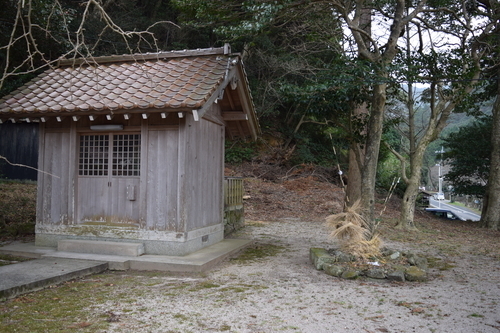 The current shrine, Inasehagi-jinja most probably appears in the Fudoki as one of the shrines under the group ‘Kidzuki no yashiro’. In the Engishiki, it’s probably in the form of the shrine ‘Oonamochi Inasehagi no kami no yashiro’. 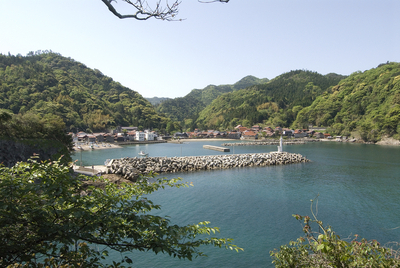 The name ‘Inase’ almost certainly refers to the god of the same name in the Kuniyuzuri myth. The shrine appears in the early Edo period publication the ‘Kaikitsudan’ as ‘Saginomiya’ and as ‘Sagi Daimyoujin’ in the woodblocks depicting the Forty-Two Bay Pilgrimage. The name Sagi-ura was taken from the enshrined area of Sagi-ura in the Fudoki. There is likely to be a link with this ‘Sagi’ and the similarly named ‘Shiro-usagi’ kami worshipped in connection with the aforementioned ‘Oonamochi’ god (an alternative name for the kami Ookuninushi). 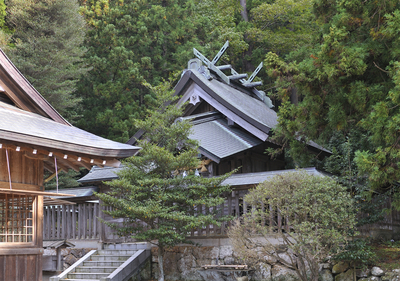 Sagi-ura is located directly behind Izumo-Taisha and its shrine ‘Inasehagi-jinja’ is an auxiliary shrine of Izumo. The enshrined deity, Inasehagi-no-Mikoto is said to have been the messenger who ran to give word of the Imperial decree imposed on Ookuninushi for the Kuniyuzuri (Land relinquishing) to his son Kotoshironushi in Miho Jinja. An interesting and as yet unsolved question is if he made this journey via the Japan Sea or if he went via Lake Shinji since at the time the area around Izumo Taisha was all sea. A New Year event at Sagi Ura, ‘Shagiri’ involves a raucous musical troupe making their way round various homes. They don ogre masks and while rubbing together the branches of a sacred Shinto evergreen tree, they enact a ceremonial cleansing from evil ritual while chanting furiously. In the past, there was a copper mine in Sagi-ura which became a genuine industry under the Matsue-clan in 1865. In the 5th year of Meiji (1872) its refining output was 116 tons. By Meiji 33 (1900), it was mining 803 tones and refining 69 tons but it closed down in the early part of the Showa Era. As for the form of the village, a thin road extends along the edge of the small bay with residential houses all in a line. Mixed in with the community is a large merchant’s property along with houses bearing trade names. It invokes imagery of the prosperous times of days gone by. The community once thrived thanks to its trade using the Kitamaebune shipping line. Now it is affected by urban migration and a decline in population but its beautiful surroundings and old town layout remain. The splendid houses in this quiet village are all reasonably priced and can be rented. Exploring the line-up of buildings in the town, seeing the sea, mountains and rivers offers a variety of ways to enjoy one’s time there. It’s a recommended getaway for those living in the noise and bustle of a big city who want some time away in a relaxing, peaceful rural area. Thanks to the ‘Usagi genki na kai’ project where empty properties are made available for new residents, there are currently 7 properties which are now home to emigrants. 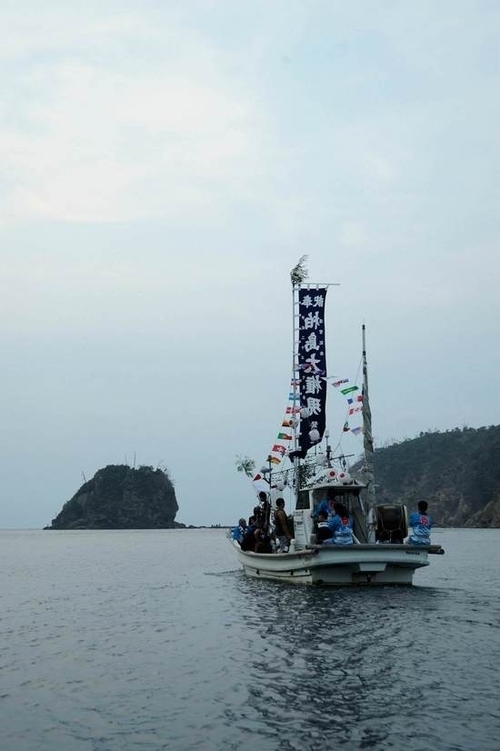 For travelers to Shimane Peninsula where shops are few, these kind of ventures can only be good news.In addition, recently the ‘Gallery Shiwakuya’ has opened in an old former residential building with the trade name ‘Shiokumi-ya’. The property is also said to contain a giant pine tree which is 400 years old. The venture gives those from both within and beyond the prefecture a place to give speeches, musical performances and exhibit crafts. The location also has a shop with refreshments etc on sale.